Crafty engineers and manufacturers keep finding unique ways to take bottle opening to the next level (despite the invention of the screw top). 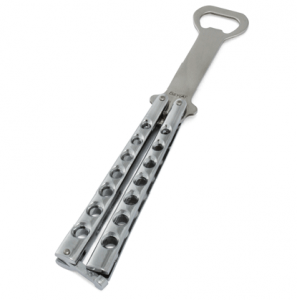 The Butterfly Knife Style Bottle opener from ThinkGeek looks just like a butterfly (or Balisong) knife and it can do all the same tricks you can do with a butterfly knife with the added benefit of opening bottles. This opener is made of food grade stainless steel (which is nice, because beer is good food) and guaranteed never to rust, no matter how many frosty bottles you pop open with it.